Preoperative cardiac risk stratification is an important aspect in the clinical practice of internal medicine physicians, cardiologists, anesthesiologists, and surgeons. Traditionally, if cardiac evaluation was deemed necessary, this was accomplished utilizing stress treadmill electrocardiography (ECG), single-photon emission computed tomography (SPECT), or stress echocardiography (Ahn et al. J Am Coll Cardiol 61:661–8, 2013). 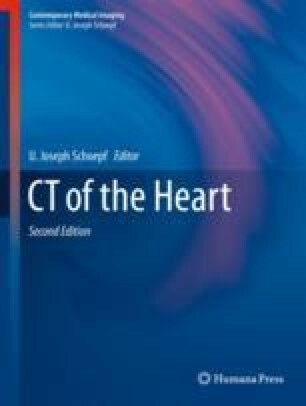 In recent years, coronary computed tomography angiography (CCTA) has become an alternative method for the evaluation of coronary artery disease and has repeatedly demonstrated the ability to exclude significant coronary stenosis with an extremely high degree of sensitivity and negative predictive value (Achenbach et al. J Am Coll Cardiol 59:E1337, 2012; Meijboom et al. J Am Coll Cardiol 52:2135–44, 2008). Additionally, CCTA has demonstrated the ability to reclassify patients within the same risk category, has distinct advantages when compared to functional testing, and may be used to alter management of patients in the perioperative period. However, to date its use in the evaluation of preoperative cardiac risk stratification has not been well established (Ahn et al. J Am Coll Cardiol 61:661–8, 2013). In this chapter, the rationale for the use of CCTA in preoperative risk assessment is described.